Madison's new obsession? 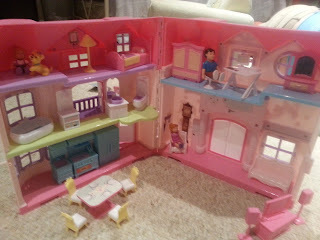 Her dollhouse. Today, we watched our daily family dynamic play out - at least, Madison's version. And man, was it eye opening. The dollhouse was a gift from Santa this year. Honestly, I wish Santa hadn't gone for the Black Friday special, and had splurged a little, because this dollhouse is a little flimsy. 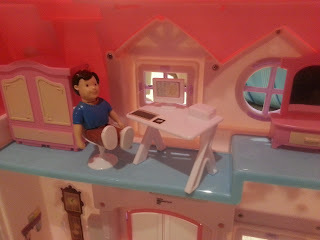 The furniture doesn't fit in the rooms, the stickers peel off the wall, the people can't really balance on the furniture...it's definitely a cheap-o dollhouse. But when Santa did his shopping, Madison wasn't even 2 1/2. She had completely lost interest in her Little People dollhouse and we weren't sure that she'd like this new one. 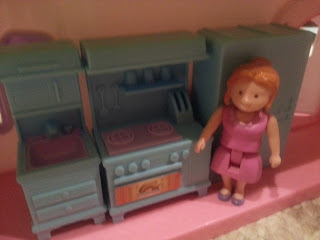 However, it's a classic toy for a little girl, so we talked it up and it went on her Christmas list. When she found it under the tree, she was really excited! 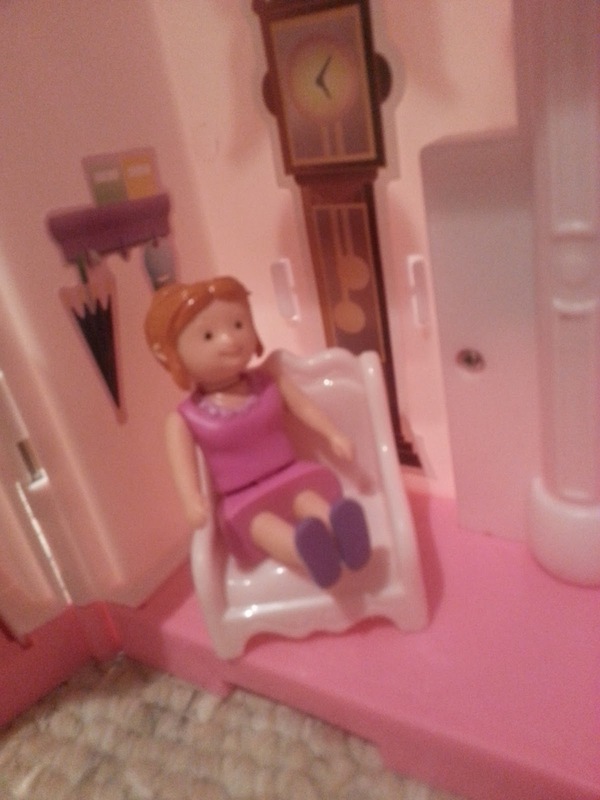 Because some of the pieces are small, the dollhouse lives upstairs in Madison's room with her other toys that have small parts (although now that I'm thinking about it, Reagan plays up there with her now. There goes that logic). And because it isn't downstairs where we play most of the day, she didn't get much opportunity to use it. She'd play with it occasionally, but not often and usually not for long. Recently, she's rediscovered it and has become obsessed. She wants to play with it all the time. The dollhouse only has three characters. Our family has four. However, Madison is not deterred. Our family is still acting out scenes in Madison's mind. Today I tried to be sneaky and catch her, asking what was going on as she played. 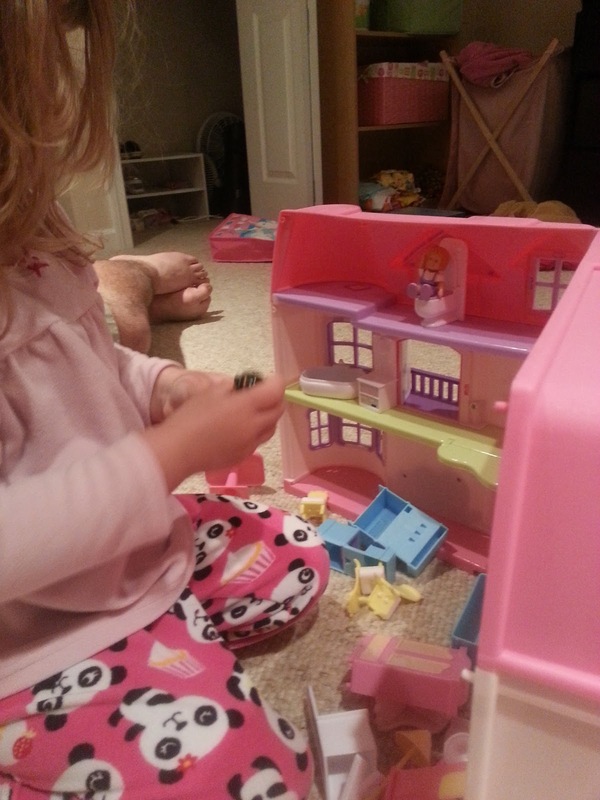 Sidenote: she likes to play with her dollhouse ALONE. She was completely thrown by my presence and questions. I think I may need to set up a spy gadget. Mommy, Daddy and Madison in the dollhouse. We all seem a little ... familiar. Me: Oh, Madison! I see Mommy is in the kitchen? Is she cooking dinner? Madison: No, the mommy is drinking her coffee. She can help you when she's all done with her coffee. But let her drink her coffee first and talk to Diana on the phone. Well, it appears my morning routine is well established. 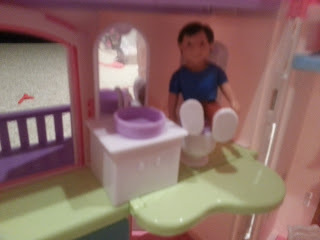 Madison: (giggles) Oh, he's just pooping. He'll come back down for his laptop. Me: And what's Madison doing? Madison: She's playing. The doggie wants to play with her. But the doggie needs to go away. I think Mommy should come up and help Madison and make the doggie leave her alone. 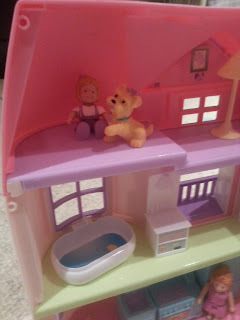 Madison does NOT like dogs right now, and it appears that dollhouse Madison feels the same way. What I think is funny is that dollhouse Madison needs to deal with the dog. It would be so easy for Madison just to not include the dog. 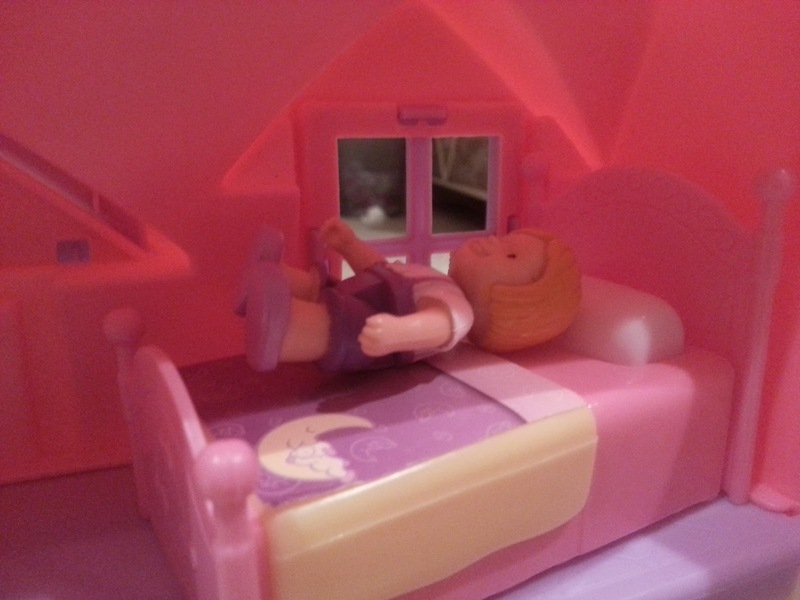 Well it appears that Mommy did not save dollhouse Madison. She moved from coffee drinking to sitting with her feet up in the living room. Ummmm....Madison? Me: Is the mommy sitting down? Madison: She's sitting in Daddy's chair. Me: What is she doing there. Me: Well, what does your Mommy do? Does she play with you? Does she help clean up? Wow. So glad all our fun activities are so well remembered. Madison: He's on the phone. Me: Is that all Daddy does? Madison: Um, yes. And he has a laptop. He's just watching the Rainbow song. Me: It looks like baby Reagan is tucked in so nicely. Where is Madison? Madison: That's Madison. Reagan is underneath her. They're just playing. It's ok Mommy, Reagan likes it! No one is playing rough. So there you go. Mommy drinks coffee and then lounges in Daddy's armchair. Daddy spends his time split between the bathroom and the phone, and after a long day of forcing herself to be near a dog, Madison climbs on top of her baby sister. Madison starts preschool in the fall. I can only imagine the stories she'll tell her teachers if this is how she feels her life plays out. At what point can I expect the phone call? Day 1? Or maybe, this wasn't how she normally plays, and this was her way of messing with me. Yeah, I'm going with that.